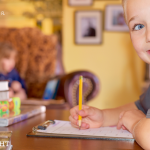 I read this article and wanted to share it with you: Reasons to Keep (and Not Resell) Your Used Homeschool Curriculum https://blog.sonlight.com/keep-used-curriculum.html. 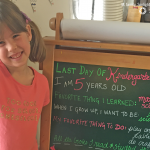 When you use a literature-rich program for homeschool, you don't ever outgrow your curriculum. 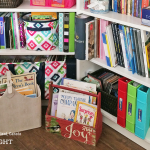 Although reading skill grows and Readers increase in difficulty, your Read Alouds, biographies, and nonfiction titles remain a valid part of your home library, enriching your experience again and again through the years. 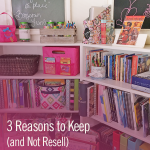 That's why we encourage you to grow your family's library by keeping—not reselling—your homeschool curriculum. I'd like to offer you three reasons why. #1 You have books ready to learn from again and again. This is an enormous benefit. 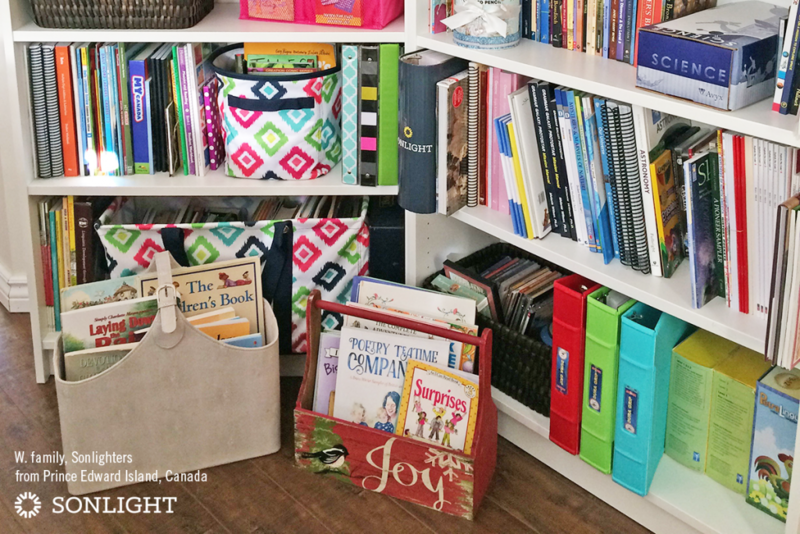 With Sonlight, your children enjoy so many favorite books that they will want to read repeatedly. And every time, they will learn something new. Or will learn something old more deeply. This was Sarita’s experience with her children. She often found them reading and re-reading books they had read even years before. Because they were that much fun and that engaging. And each time, something new was planted in their hearts. Now Sarita’s grandchildren pull out books from Sonlight programs they’ve finished. They cross-reference what they’re learning currently with what they’ve learned in the past: ancient ships, maps from the time before Columbus, animal facts (usually to prove a point to a parent). Even a dyslexic grandson, who does not yet read books on his own, will pull books from previous programs in order to prove a point. “Remember how we read about the triremes?” Or “Like in this book—everyone dies.” And an artistic grandson will imitate some of the drawings. Many weeks Sarita's daughter will round up and re-shelve a dozen Sonlight books that aren’t part of current studies. 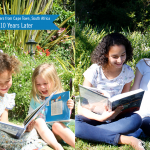 Her grandchildren are actively using their Sonlight books. If you sell your Sonlight books, or if you have to return them to the library, your children will miss this layered learning effect. Books are quite durable. And if a book wears out from over-love, what a way to go! While you may have to buy the occasional replacement, the vast majority of Sonlight books are purchase once, reuse again and again. #2 You have book friends to turn to whenever you want. When you read a book the first time and fall in love with it, you are finding out how the story unfolds. When you revisit a book, you remember (either entirely or at least a bit) how the story unfolds. But now you can enjoy the pleasure of reading a story you know you love, with the memory of the first time you read it. And that past experience with the book makes the experience richer. You notice details you missed the first time—the hints along the way. You know the book is beautiful, so you read it without the question of whether you will like it. You know that you do . . . and will again. If you sell your Sonlight books, or if you have to return them to the library, you are parting with book friends. #3 You make a statement about who you are. It's the trendy thing these days is to be a minimalist. The fewer items you possess, the closer you are to zen perfection, or something like that. And I am not one for mass possession, but I make room for my books. "Another thing that has been lost with digitization and free information is an appreciation for the objects in a collection. A person’s music library was once, not so long ago, a collection to admire, possibly envy, and a way to learn something about its owner. Because record albums had to be purchased one by one, because they were relatively expensive and took up space, music lovers compiled such libraries deliberately, with thought and planning. We educated ourselves about musical artists so that we could become more careful consumers. The costs of making a mistake encouraged us to think carefully before adding a clunker to the collection. High school and college students would look at a friend’s record collection and wander through it, allowing themselves a glimpse of their new friend’s musical tastes and the musical paths that he or she presumably crossed to acquire this particular collection of music." Change record albums to books, and musical artists to authors, and his point applies to your homeschool curriculum. What you own says something about you. If you own a television in every room, you are communicating something about what you value. If you own twenty-five designer purses, you’re communicating something else. A home library communicates that your family is curious, interested in history and stories, and tends more towards books than towards digital products when it comes to education and information. When people come to visit, they get an idea of what you’re like as a family based on your bookshelves (whether they ever browse them or not). A physical library tells everyone who enters your home a little bit about who you are as a person. The titles of the books themselves show your interests, concerns, and passions. They provide touch points for conversation. If you sell your Sonlight curriculum, or if you have to return your Sonlight books to the library, you miss out on these relational anchor points. #4 You enjoy the tactile comfort of a book. "[M]any of us still find something soothing and satisfying about handling physical objects. Memory is multidimensional, and our memories for objects are based on multiple attributes." Have you ever experienced I have a hunger to reread an old Sonlight book? Maybe you long for the comfort in the Cornstalks book of poetry by James Stevenson in History / Bible / Literature C. Or maybe you are disheartened about the world and in need a story of God’s faithfulness. So you turn to The Hiding Place or The Insanity of God, both part of high school programs. You may crave the truth in those books, or the aesthetic beauty, or the soul nourishing. And maybe you want to share that book with my children, or maybe you want it just for yourself, but you want to hold that book, and return to it, to remind yourself that there is something real and good and true in the world. If you thought Sonlight was just good because you can check off the boxes and ship the books away . . . you might reconsider. If you let them, these books can become companions, ready to offer a laugh or a cry, a reference to an interesting fact or a needed word of wisdom. SonlightCares is worth more than the $10 you save. Of course, you can build a home library using the Sonlight booklist and taking it to any of our competitors. Many people do that. If they buy used, they sometimes save money. If they buy new, they might save $10 (literally—people experiment with that, and order from Sonlight in the future). ​​When people buy from others, we are still grateful that they homeschool their children. Of course. ​​But we end up feeling like a waiter who just had happy customers leave without a tip. A good waiter would be happy that the customers were fed . . . but left feeling a little flat about all the hard work offering such little return. That said, if this year you’re only able to buy used—if you’re financially not able to afford Sonlight this year, even with the payment plan we offer—we understand, and bless you on your journey. We hope that you will keep us in mind in the future. Come. 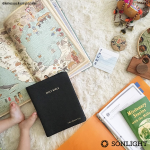 Join Sonlight families all over the world and help your children love to learn and love to read. Browse curriculum options to get started today!